We are deal in Polyamide Pipes. 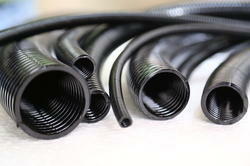 We at S.S.SON CONTROLS ( Mumbai ) are among the leading suppliers of Slitted Flexible Conduits . These conduits are made out of diffferent materials like Polypropylene , Polyethylene , Polyamide etc . This product has dual use i.e as a hose and also as an electrical conduit. Hose uses include a light duty suction and delivery application for water, Garden and similar light duty pumps. For electrical applications suitable for both internal and external uses to protect electric cables can be used as both electrical conduit and light duty suction and delivery application for light duty pumps. Being the leading names in the industry, we offer our clients an exceptional range of PVC Jacketed FlexibleConduit that are durable in nature and are sturdy in construction. We offer them in varied sizes and diameters and are valued for excellent performance and easy installation. PVC Coated Galvanized Flexible Conduit technical data and specifications as below tables, Any kind of special PVC Coated Galvanized Flexible Conduit can be developed and supplied exactly as per customer specifications and requirement. This is a heavy duty Conduit with inner core made of Hot dipped galvanized strip helically square locked & outer layer prime soft quality Halogen free PVC with Nylon cord to make it liquid light. SPEEDWELL PVC Corrugated Conduit is weatherproof and highly flexible - suited to a wide range of applications in a cable management system. Generally available in Black Color. Welcome to poly flex enterprises manufacturer of Flexible conduit. These high quality flexible conduit is made with the characteristics of high tensile resistance, vandalism resistance. The i. D. Is from 12mm to 51mm. We have in store for our clients, a quality assured gamut of PVC flexible conduits that is resistant to abrasion and corrosion. These PVC flexible conduits, along with its own benefits are supplemented with limited fire hazard covering for enhanced safety. Our range of conduits is offered to our clients in their specific requirements at industry leading prices. - Applicable to electrical, machinery, and building harness wiring. IP RATING : IP 68 with ends property sealed or in combination with suitable glands. Resistant : Most chemicals and alkalies, good weathering properties . UV stabilized conduits available upon request. Slitted conduit pipes available on MOQ basis. 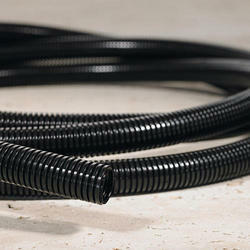 We are the Leading Manufacturer of Polyamide Conduit we prefer only bulk quantity.